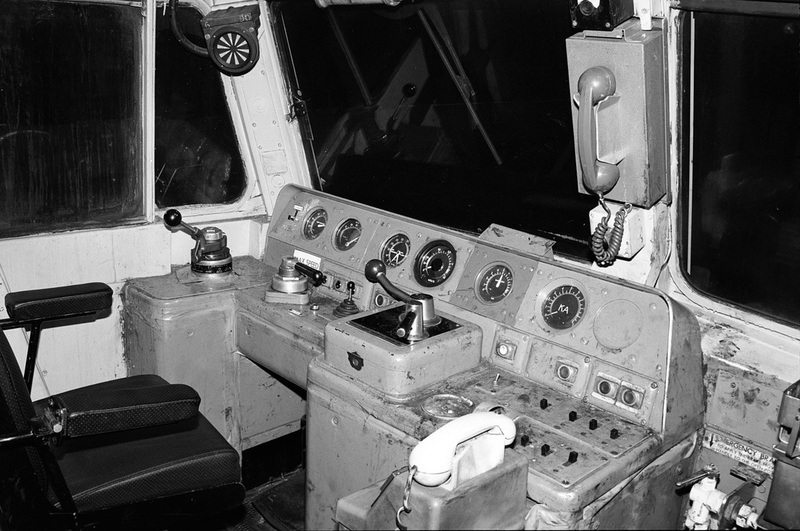 Above: Class 47 early build - original condition. 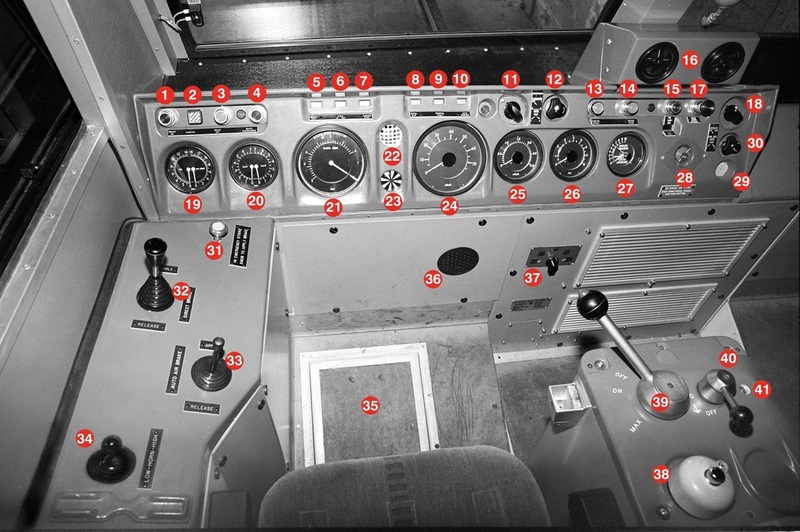 23 - AWS reset button, 24 - Windscreen wiper valve [drivers side], 25 - Windscreen washer button, 26 - Switches for - compartment lights, foot warmer, cab heaters, tail lights, windscreen demister, instrument lights, route indicator display, 27 - Anti-slip brake button [in knob of power controller], 28 - Fire alarm test button. 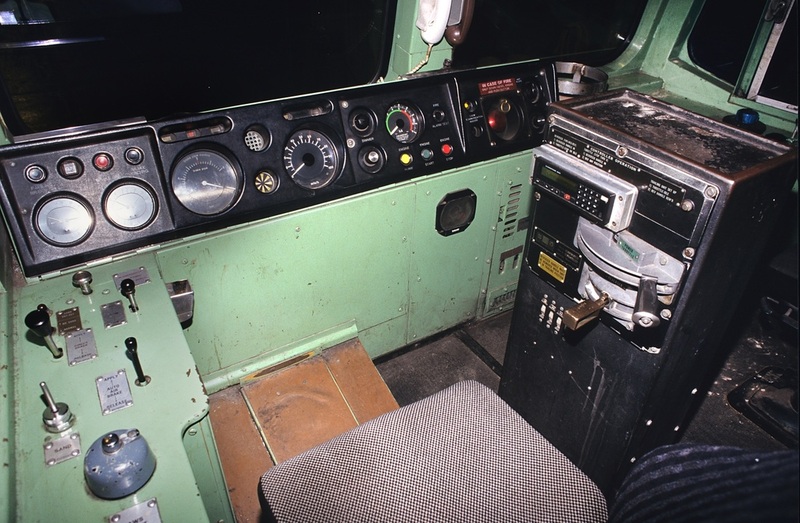 Left: Standard Class 47 driving cab equipment, as refurbished by Crewe Works for operation with Rail express systems (RES). 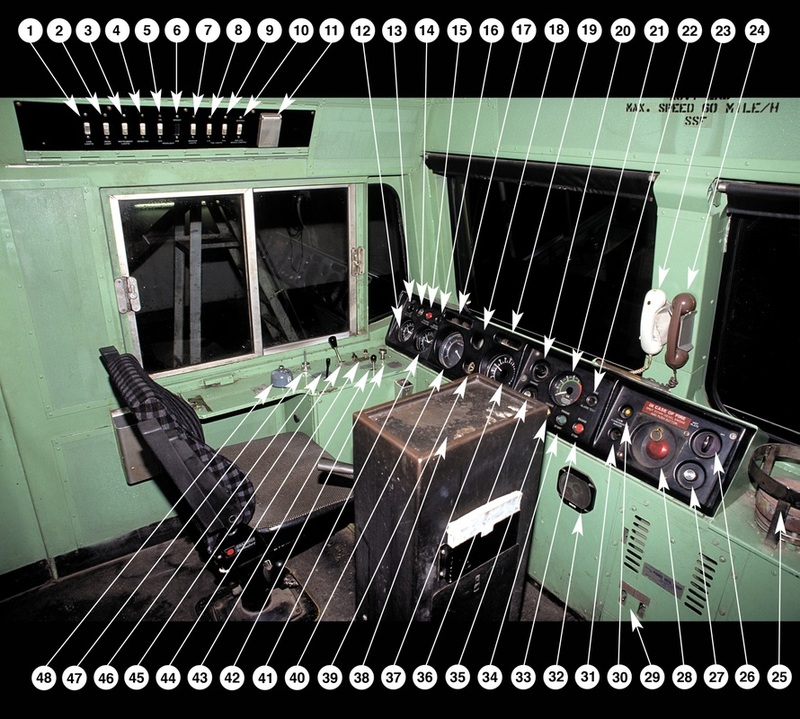 The loco shown is No. 47767. 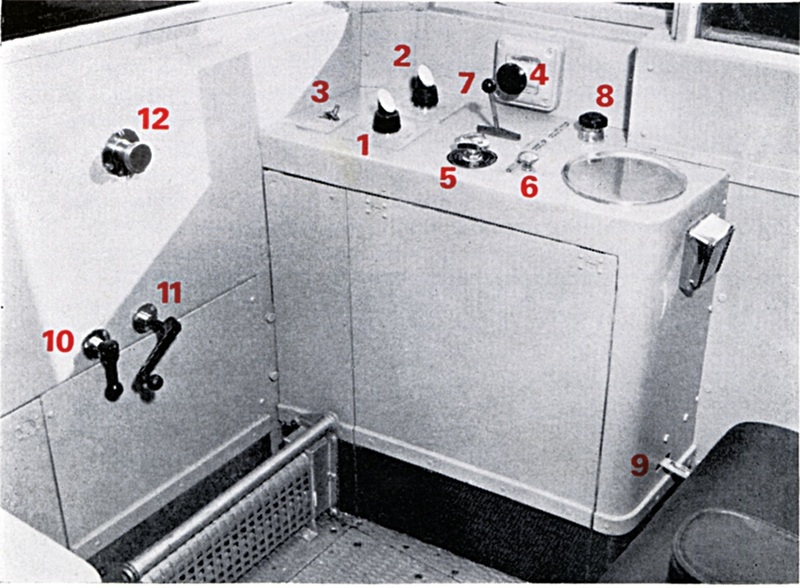 1 - Automatic brake valve (operates train air or vacuum brakes and proportionally the air brakes on the loco), 2 - AWS sunflower indicator, 3 - Straight air brake valve (operates air brakes on loco only), 4 - Headlight switch, 5 - Main reservoir air pressure gauge, 6 - Bogie brake cylinder pressure gauge, 7 - Vacuum gauge, 8 - Speedometer, 9 - Brake pipe pressure gauge, 10 - Traction motor overload reset button, 11 - Main generator/alternator output, 12 - Electric train supply ‘on’ and ‘off’ buttons, 13 - Fire alarm test button, 14 - Brake overcharge button, 15 - Cab heat switch, 16 - Drivers ash-tray, 17 - Drivers safety device pedal, 18 - AWS reset button, 19 - Light display (left to right - engine stop light [red], wheelslip light [amber], alarm light [blue], 20 - Warning horn valve, 21 - Master key socket, 22 - Engine start/stop buttons, 23 - Main power controller (with anti-slip button in red knob), 24 - Master switch, 25 - Electric train heat (supply) warning light dimmer switch), 26 - Cab - shore telephone, 27 - Electric train heat (supply) warning light, 28 - Switches [left to right] tail light switch, demister switch, desk light switch, marker light switch, 29 - Switches [left to right] compartment light switch, foot rest warmer, cab heat drivers side, cab heat secondmans side. 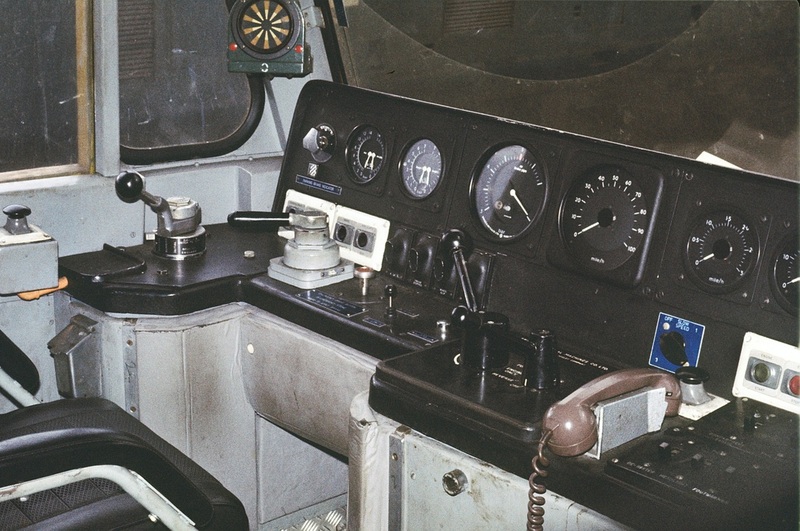 Below: Class 47/7 No. 47710. 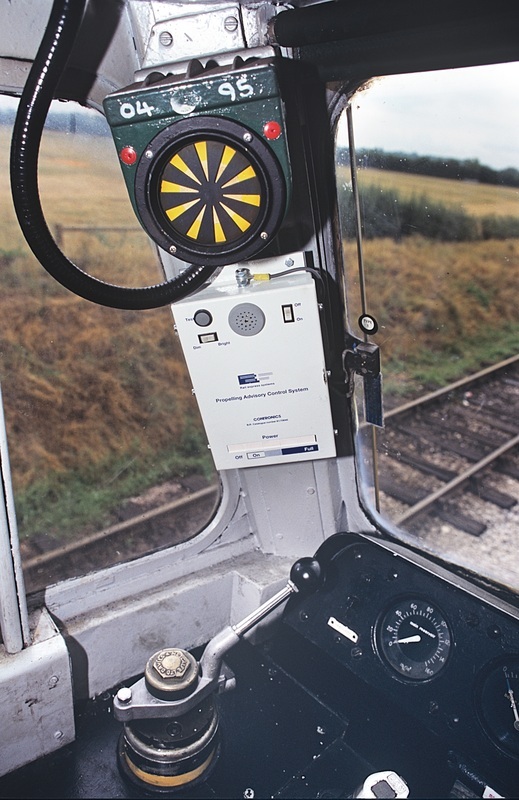 Class 47/7 fitted with Propelling Advisory Control System (PACS). 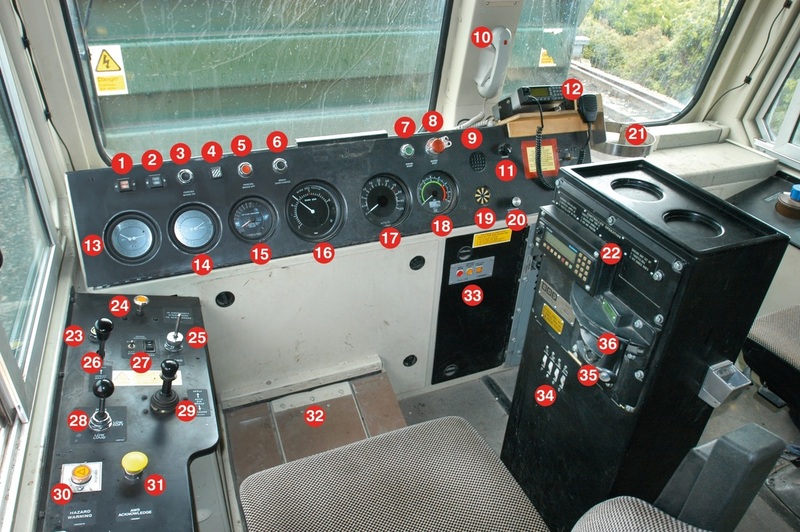 Class 50 cab layout. 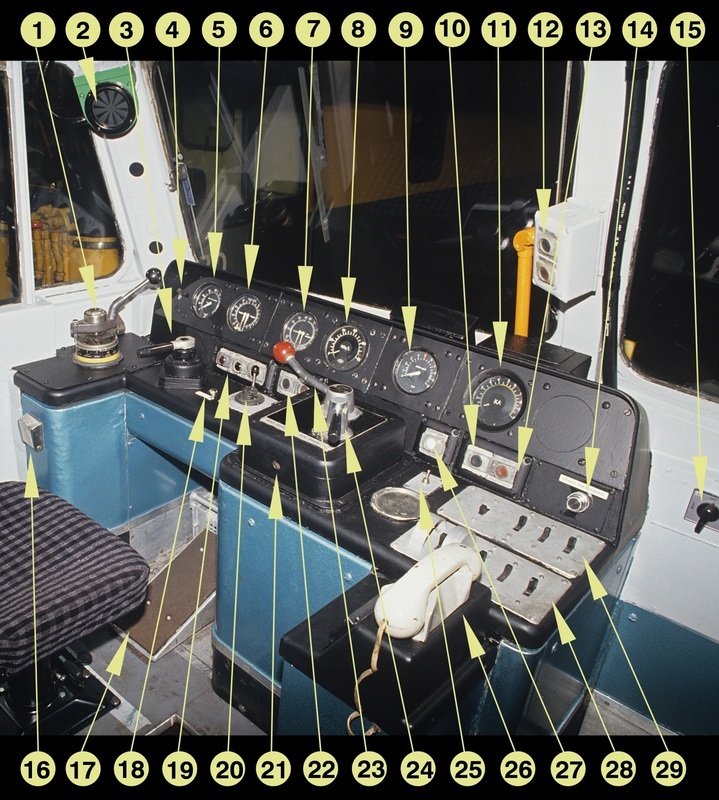 Above illustration shows the ‘as built’ design (D400) and the lower picture shows the refurbished condition (50149). 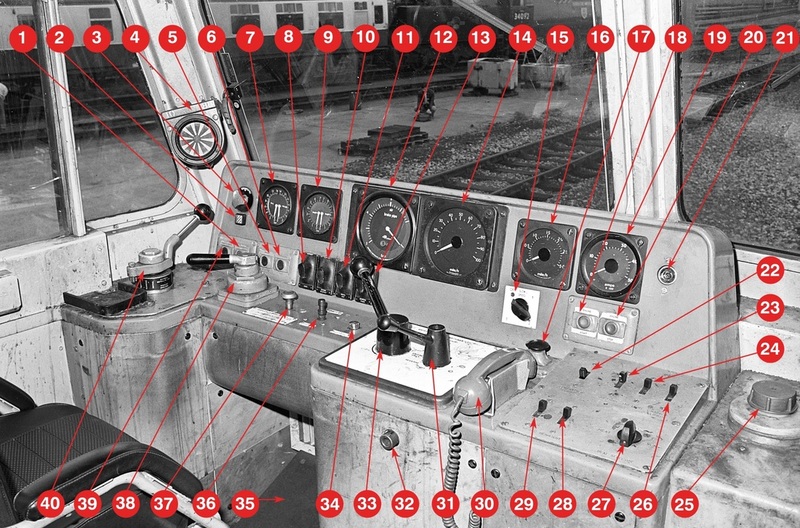 1: Brake pipe pressure gauge, 2: AWS re-set button, 3: AWS ‘sunflower’ indicator, 4: Vacuum brake gauge, 5: Bogie brake cylinder pressure gauge, 6: Speedometer, 7: Current limit set switch, 8: Wheelslip warning light, 9: Overload reset button, 10: Ampmeter, 11: Engine start button, 12: Slow speed control speedometer, 13: Engine stop button, 14: Slow speed control speed set switch, 15: Fault light, 16: Engine stopped warning light, 17: Route indicator control handle, 18: Fire alarm test button, 19: Main reservoir gauge, 20: Train heat on warning light, 21: Train heat warning light dimmer switch, 22: Straight air brake valve, 23: Train brake valve (proportional on loco), 24: Anti-slip brake button, 25: Windscreen wiper valve (drivers side), 26: Screen wash push button, 27: Horn valve, 28: Instrument light dimmer switch, 29: Master switch, 30: Power controller, 31: Cab ventilation controller, 32: Hot plate switch, 33: Hot plate, 34: Train heat on button, 35: Train heat off button, 36: Radio telephone, 37: Buzzer, 38: Headlight switch. Above English Electric Type 5, Class 55 'Deltic' as delivered. 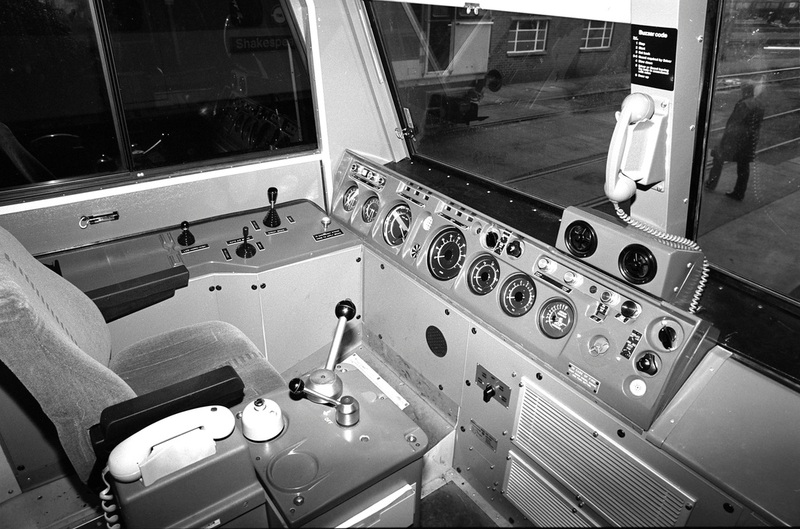 Class 55 No. D9016 (55016) with head/marker/tail light modification and cab radio. Above: Class 56 No. 56012 in 'as delivered' condition. 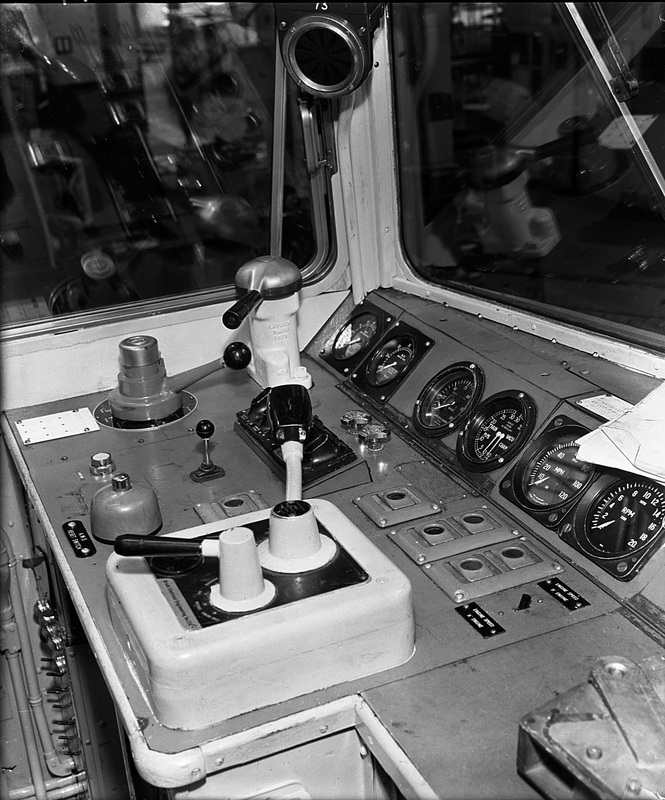 Above: Production Class 56 cab (BREL Crewe example) No. 56130. 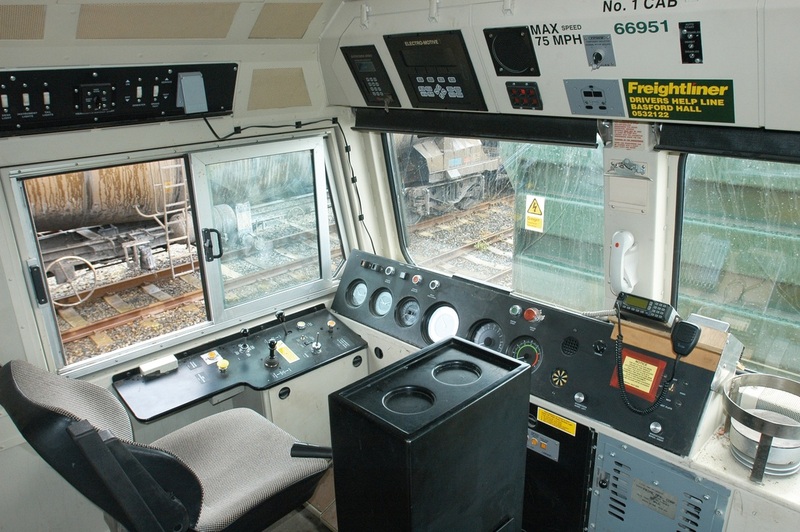 Class 56 cab layout. 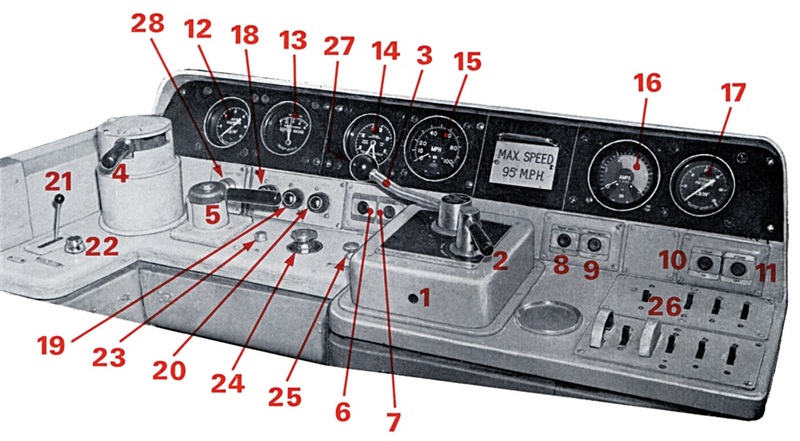 1: Parking brake release button, 2: Parking brake indicator, 3: Windscreen wiper valve (driver’s side), 4: AWS sunflower indicator, 5: Brake overcharge button, 6: Fire alarm test button, 7: Main reservoir and main air pipe gauge, 8: AWS indicator light, 9: Brake cylinder gauge, 10: Engine stop warning light, 11: Wheel spin warning light, 12: Brake pipe gauge, 13: General fault warning light, 14: Main speedometer, 15: Slow speed selector switch, 16: Slow speed speedometer (0-3mph), 17: Cab-Cab telephone call button, 18: Engine start button, 19: Alternator ampmeter, 20: Engine stop button, 21: Call buzzer, 22: Between cab compartment light switch, 23: Left tail light switch, 24: Right tail light switch, 25: Windscreen washer water bottle, 26: Marker light switch, 27: Cab heat switch (air conditioning if fitted), 28: Headlight switch, 29: Cab window de-mister switch, 30: Cab-cab telephone, 31: Master switch (off, reverse, engine only, forward), 32: Master key socket, 33: Power controller, 34: Automatic warning system re-set button, 35: Drivers safety device and vigilance pedal, 36: Warning horn valve, 37: Emergency brake plunger, 38: Straight air brake valve (loco only), 39: Parking brake apply button, 40: Automatic brake controller (train and loco). Cab of No. 56130 illustrated. Above: Class 57/0 - No. 57001. 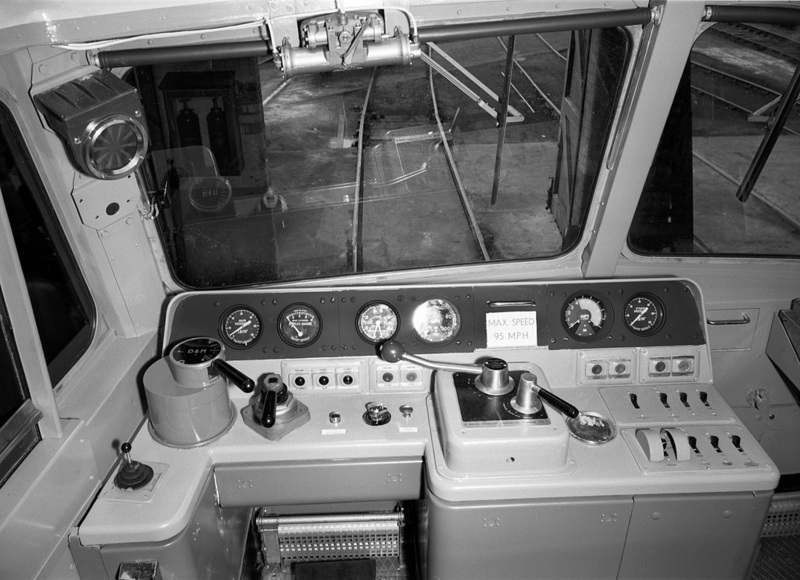 Class 57/3. Above: drivers side, Below; Non-driving side. 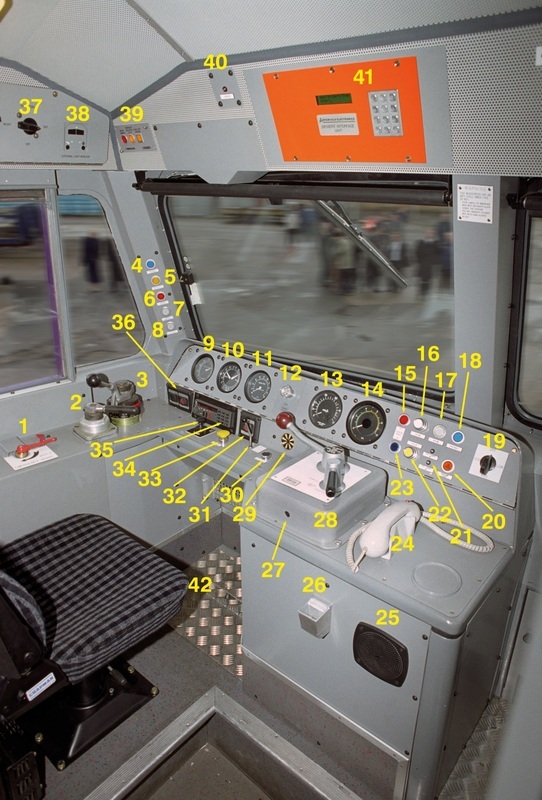 14: Alternator output (traction), 15: Parking brake on button, 16: Electric train heat on button, 17: Electric train heat on indicator, 18: Electric train heat fault light. 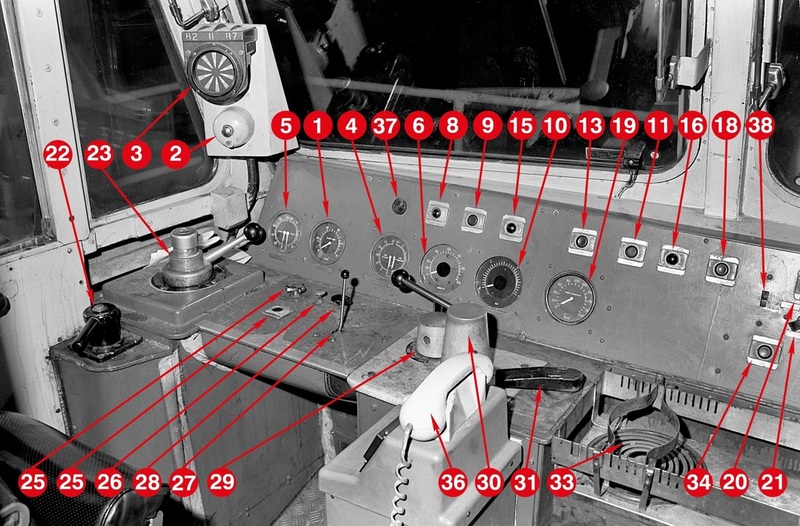 19: Cab heat switch, 20: Headlight flasher (hazard warning), 21: Electric Train Supply earth indicator lights, 22: Electric Train Supply off button, 23: Parking brake off button, 24: Cab radio handset, 25: Radio loudspeaker, 26: Ashtray (now removed), 27: Master key socket, 28: Master switch and power controller, 29: AWS indicator, 30: Windscreen washer button, 31: Warning horn valve, 32: Fire alarm test button, 33: AWS reset button, 34: National Radio Network cab set, 35: Windscreen wiper control, 36: Engine start/stop buttons, 37: Headlight control switch, 38: Headlight/marker/tail light indicator, 39: TPWS panel, 40: OTMR indicator, 41: OTMR interface panel, 42: DSD pedal. The cab illustrated is from No. 57601. 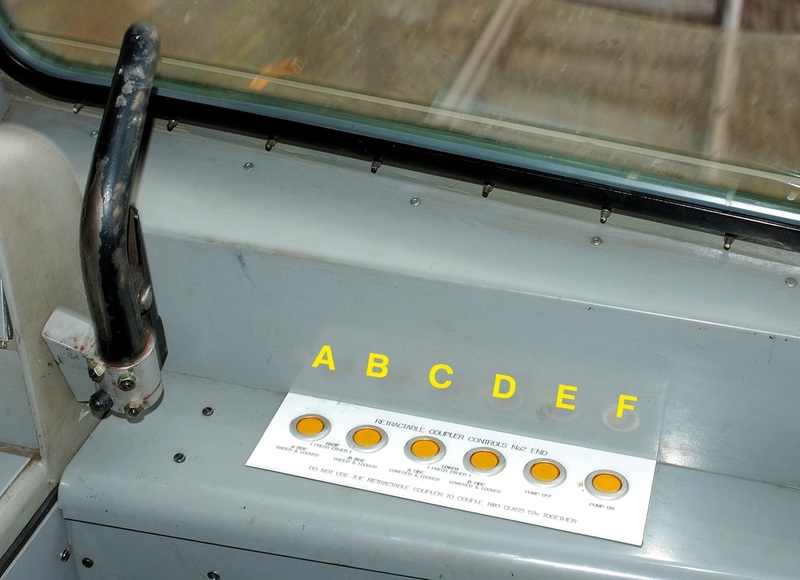 Above: Class 58. : 1 - Marker light switch, 2 - Tail light switch (left side), 3 - Tail light switch (right side), 4 - Brake control switch service/isolate, 5 - Inspection light socket, 6 - Parking brake on button, 7 - Cab radio, 8 - Cab radio handset, 9 - Parking brake status indicator, 10 - Parking brake release button, 11 - Brake overcharge button, 12 - Brake test indicator light, 13 - AWS in/out (operational/isolated light, 14 - Engine stopped light, 15 - AWS sounder, 16 - Wheelslip indication light, 17 - General fault light, 18 - Slow speed selection switch, 19 - Slow speed speedometer, 20 - Main alternator ammeter, 21 - Q-tron Datacord 6100 event recorder (OTMR), 22 - Track Protection & Warning System (TPWS), 23 - Cab to cab crew communication buzzer and button, 24 - Fire bottle push-button (behind plastic pull screen), 25 - Hotplate switch, 26 - Screen wash/wipe (non-driving side), 27 - Cab ventilation, 28 - Fire alarm test button, 29 - Cab heat temperature switch, 30 - Cab heat on/off switch, 31 - Engine stop button, 32 - Engine start button, 33 - Screen wash/wipe (drivers side), 34 - Main power controller (pull for power) (Sand button located in end of handle), 35 - Main speedometer, 36 - AWS sunflower indicator, 37 - Brake pipe and control reservoir pipe gauge, 38 - Brake cylinder pressure gauge for bogie No. 1 and No. 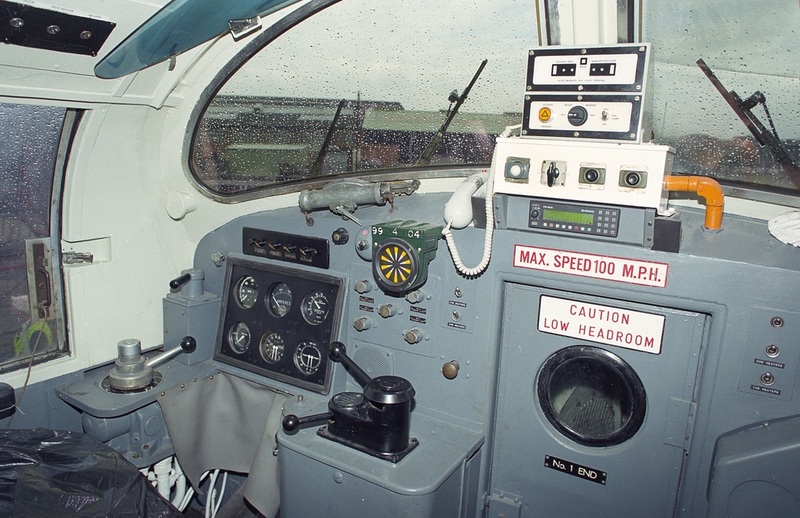 2, 39 - Main reservoir and main reservoir pipe pressure gauge, 40 - Emergency brake plunger, 41 - Horn valve, 42 - Train length countdown button (yellow) with Hazard warning switch (orange) in front, 43 - Auto brake controller switch controlling the trains brake and proportionally on the locomotive - switch is pushed forward to apply, upright for lap (or hold pressure) and pulled back to release, 44 - Straight (direct) air brake switch, controlling the brakes on the locomotive, switch is pushed forward to apply, upright for lap (or hold pressure) and pulled back to release. 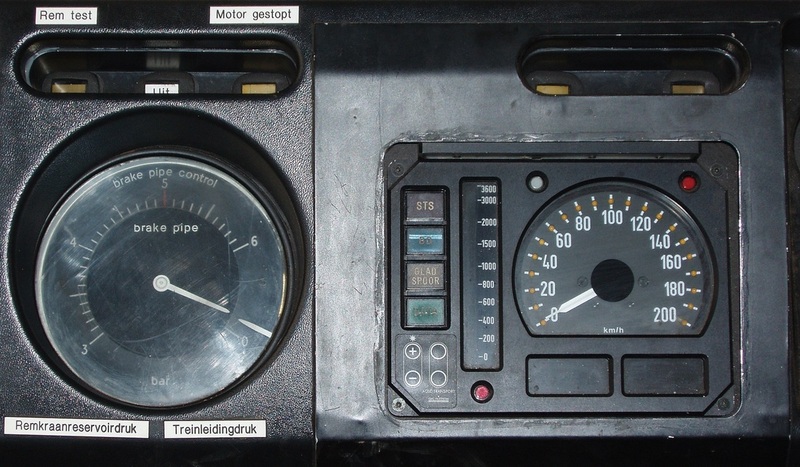 Left: Dutch ATP panel, installed in place of AWS and speedometer panels. 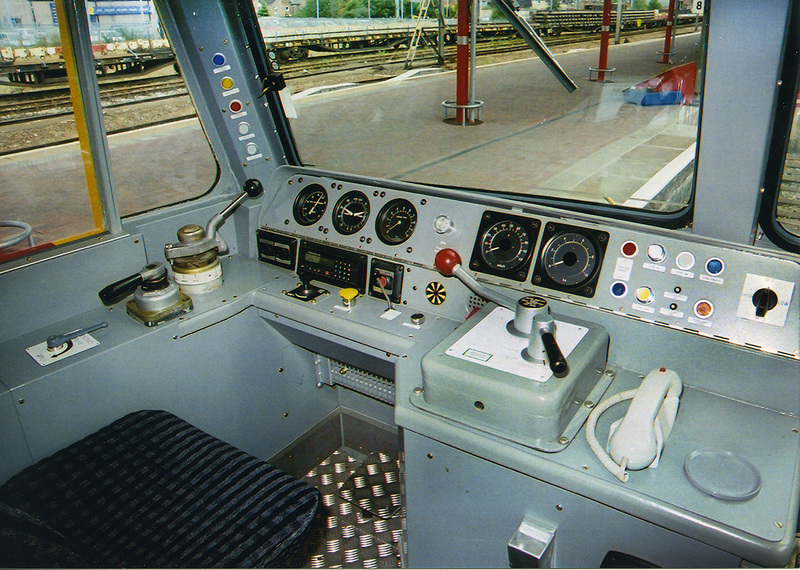 Above: Class 59 driving cab equipment layout. 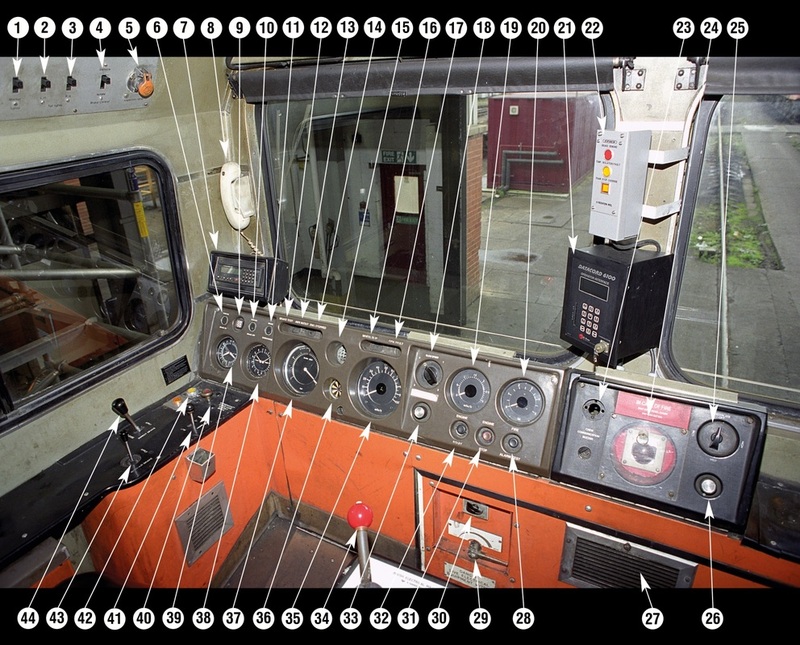 1 - Cab light switch, 2 - Desk light switch, 3 - Instrument light switch, 4 - De-mister light switch, 5 - Headlight on/off switch, 6 - Headlight bright/dim switch (later removed), 7 - Marker light switch, 8 - Tail light switch (left side), 9 - Tail light switch (right side), 10 - Brake control switch, 11 - 74V dc power socket, 12 - Main reservoir pressure gauge, 13 - Parking brake apply button, 14 - Parking brake indicator, 15 - Parking brake release button, 16 - Brake overcharge button, 17 - Indicator lights (left - brake test, middle - AWS operational/isolated, right - Engine stopped), 18 - AWS warning buzzer, 19 - Indicator lights (left - Wheel slip, right - General fault),20 - Indicator light dimmer switch, 21 - Main generator ampmeter, 22 - Fire alarm test button, 23 - National Radio Network handset, 24 - Cab to cab telephone, 25 - Hot plate, 26 - Hot plate control switch, 27 - Non driving side windscreen wash/wipe switch, 28 - Fire alarm push button, 29 - Cab heat controls (left - high speed blower, right - reset button), 30 - Cab to cab call buzzer button, 31 - Cab to cab call buzzer, 32 - Cab loudspeaker, 33 - Engine stop button, 34 - Engine start button, 35 - Engine start prime button, 36 - Driving side windscreen wash/wipe switch, 37 - Speedometer, 38 - Main power controller pedestal with cup recess on top, 39 - AWS ‘sunflower’ indicator, 40 - Brake pipe and control reservoir pressure gauge, 41 - Brake cylinder pressure gauge, 42 - Emergency brake plunger, 43 - Horn valve, 44 - Auto sand isolation switch, 45 - Direct brake controller (loco only), 46 - Automatic brake controller (train and proportional on loco), 47 - Sand control valve, 48 - AWS re-set button. No. 59002 illustrated. 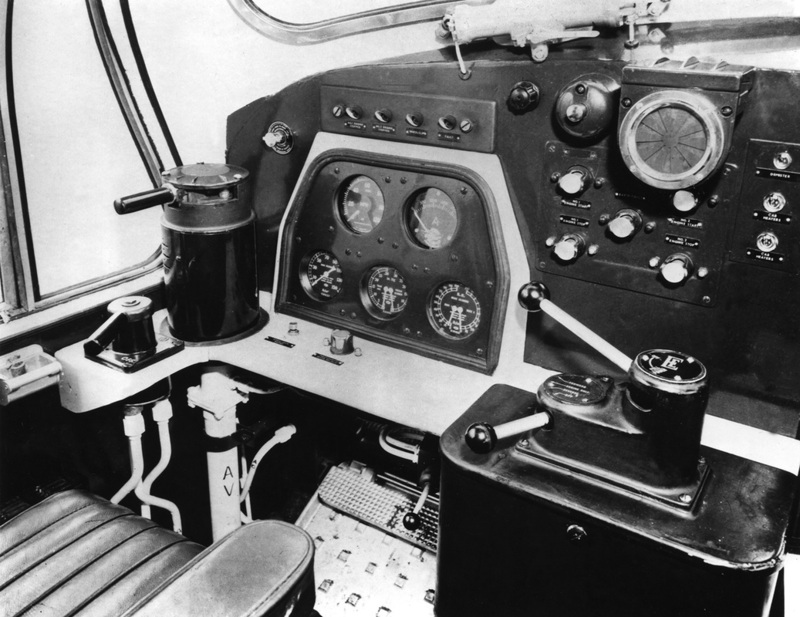 Right: Isolation switch, C - Engine run switch, D - Generator field switch, E - Control and fuel pump switch, F - Slot for removable master switch (reverser), with positions for forward, engine only and reverse, G - Power controller (throttle), moved forward to increase power and rearwards to reduce power ( shown in off position). No. 59002 illustrated. Above: Class 59/0 No. 59003 showing Foster Yeoman modifications for joint FY/DB contract. 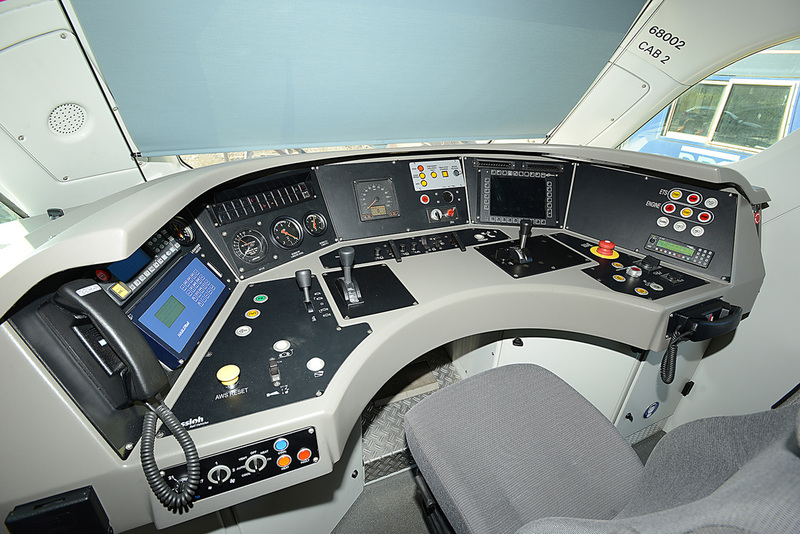 Above: Class 60 cab layout, as delivered. 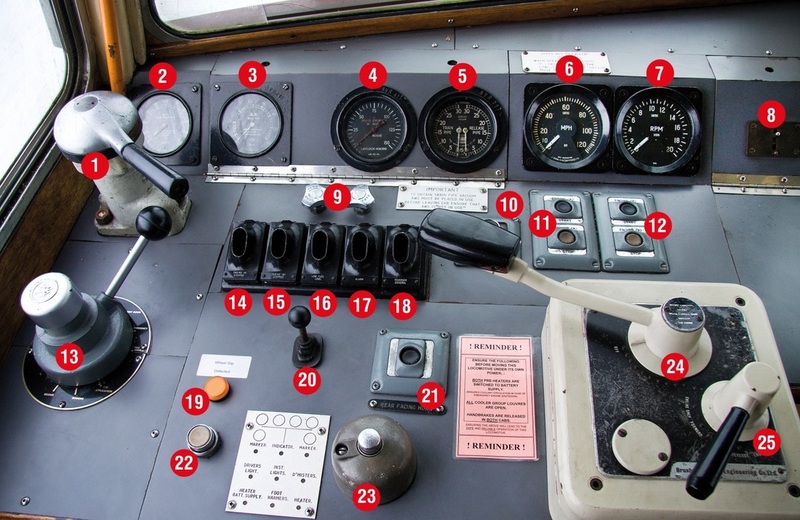 1: Parking brake apply, 2: Parking brake indicator, 3: Parking brake release, 4: Brake overcharge button, 5: Brake test indicator, 6: AWS 'in' 'out' light, 7: Engine stop light, 8: Wheelslip warning light, 9: Fault light, 10: Auto sanding working, 11: Slow speed control (SSC) switch, 12: Screen wiper switch, 13: Engine start button, 14: Engine stop button, 15: Fire alarm test button, 16: Cab ventilators, 17: Cab-cab buzzer, 18: Hotplate switch, 19: Main reservoir gauge, 20: Brake cylinder gauge, 21: Brake pipe gauge, 22: AWS buzzer, 23: AWS 'sunflower' indicator, 24: Speedometer, 25: Slow speed control speedometer, 26: Traction ammeter, 27: Air flow indicator, 28: Fire alarm pull, 29: Buzzer, 30: Secondmans screen wash/wipe switch, 31: Emergency brake plunger, 32: Straight air brake, 33: Train brake controller, 34: Horn valve, 35: DSD foot pedal, 36: Loudspeaker, 37: Cab ventilation and heat controls, 38: AWS reset button, 39: Main power controller, 40: Master switch, 41: Key socket. 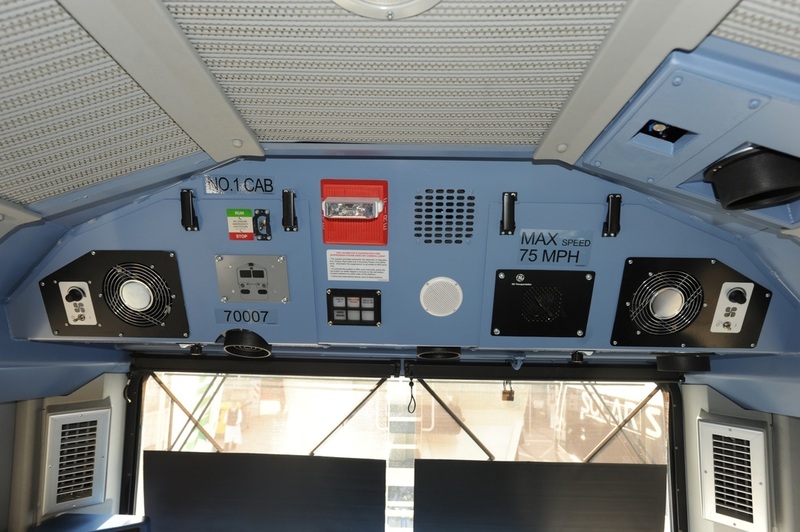 Left: Class 60 cab side panel: located above drivers side cab window. 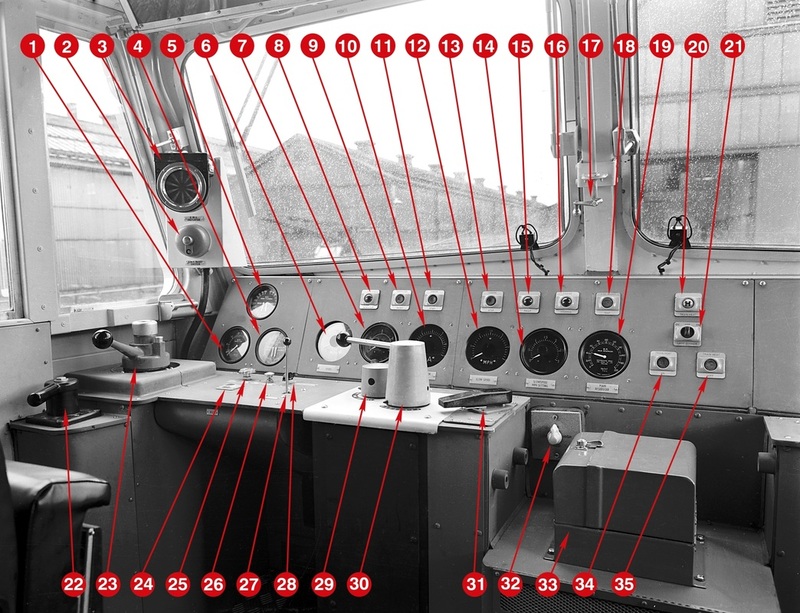 1: Cab light switch, 2: Clipboard light switch, 3: Instrument light switch, 4: Instrument light dimmer, 5: Windscreen heater switch, 6: Auto sand isolation switch, 7: Tail light switch, 8: Head, marker, tail light repeater panel, 9: Head/marker light switch, 10: Brake continuity test switch, 11: Inspection light switch. Above: Class 66/0, No. 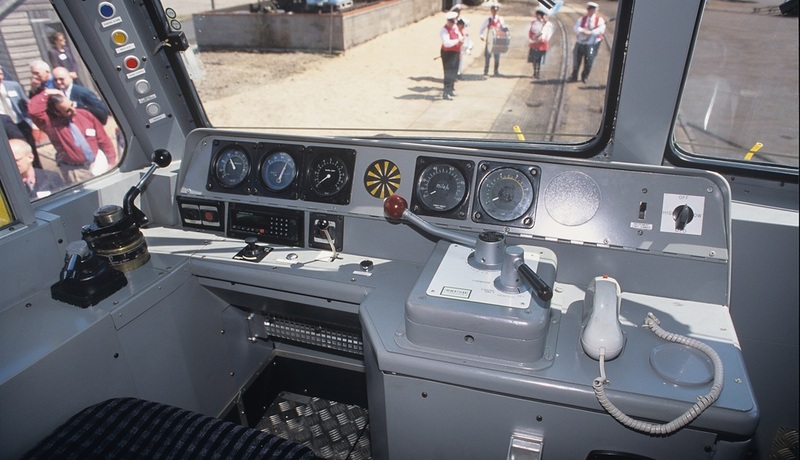 66001 as delivered, prior to entering service. Above: Class 66/9 No. 66951. 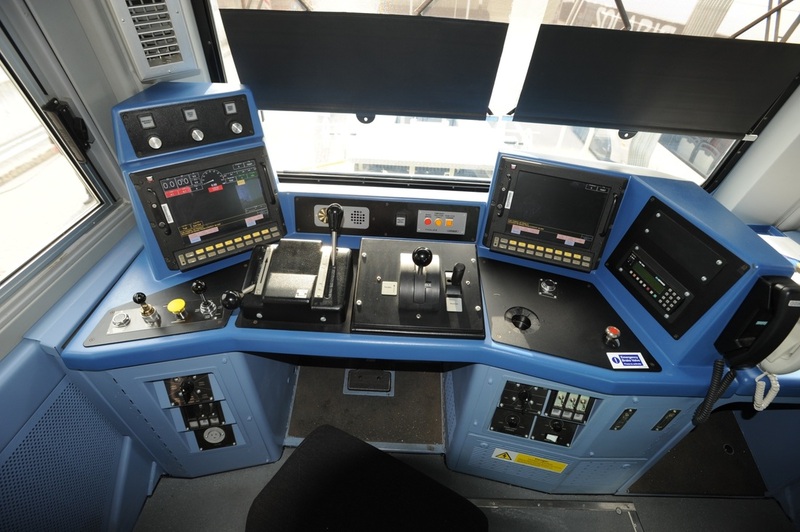 Class 66 driving cab. 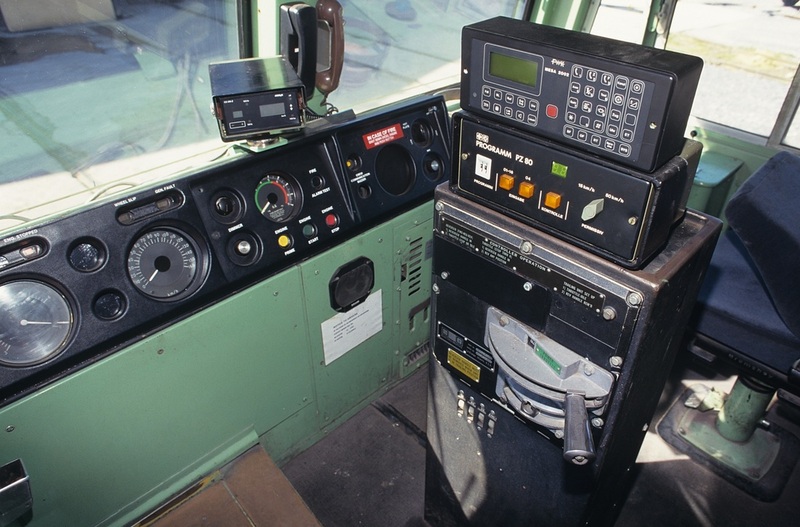 1: Brake timing indicator (passenger), 2: Brake timing indicator (goods), 3: Parking brake ‘on’ button, 4: Parking brake indicator, 5: Parking brake ‘release’ button, 6: Brake overcharge button, 7: Engine start button, 8: Engine stop button, 9: AWS alarm, 10: Cab-Cab telephone, 11: Desk indicator light dimmer switch, 12: Channel Tunnel radio (some Freightliner locos), 13: Main reservoir pressure gauge, 14: Bogie brake cylinder pressure gauge, 15: Air flow gauge, 16: Brake pipe pressure gauge, 17: Speedometer, 18: Traction ammeter, 19: AWS ‘sunflower’ indicator, 20: Windscreen wiper valve, 21: Cab hotplate, 22: NRN radio, 23: Train length button, 24: Emergency brake plunger, 25: Sand control valve, 26: Direct brake (loco), 27: Speed control switches, 28: Horn valve, 29: Auto air brake controller, 30: Hazard warning light switch, 31: AWS reset button, 32: Drivers safety device pedal, 33: TPWS controls, 34: Controller isolating switches, 35: Position for removable master switch, 36: Power controller. 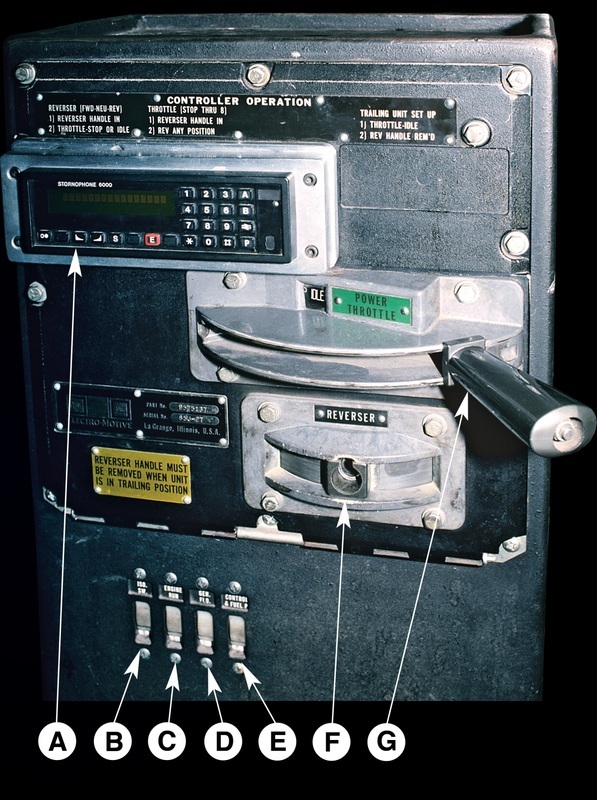 53: Windscreen wiper/washer control, 54: Damp start button, 55: Call button (other cab). The cab illustrated is loco No. 67003. 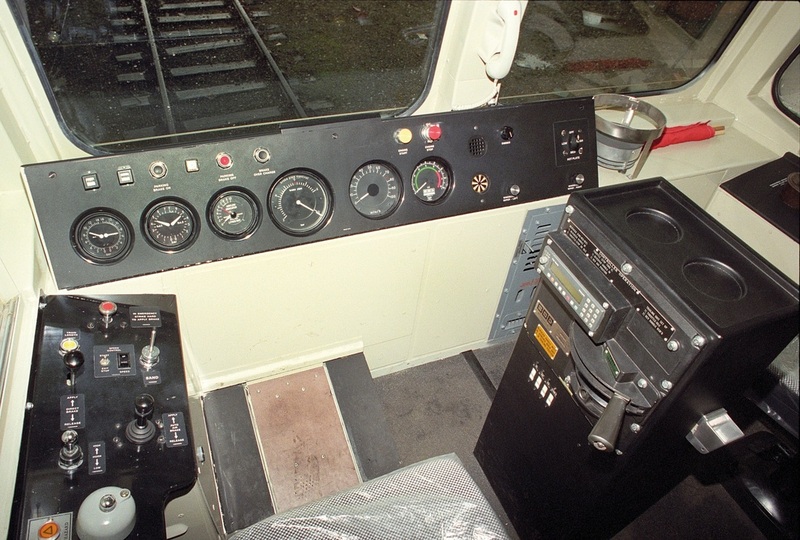 Several small modifications were done after arrival in the UK, the most noticeable being the fitting of TPWS and the slight inclination of the switch panel (41-43 on picture). 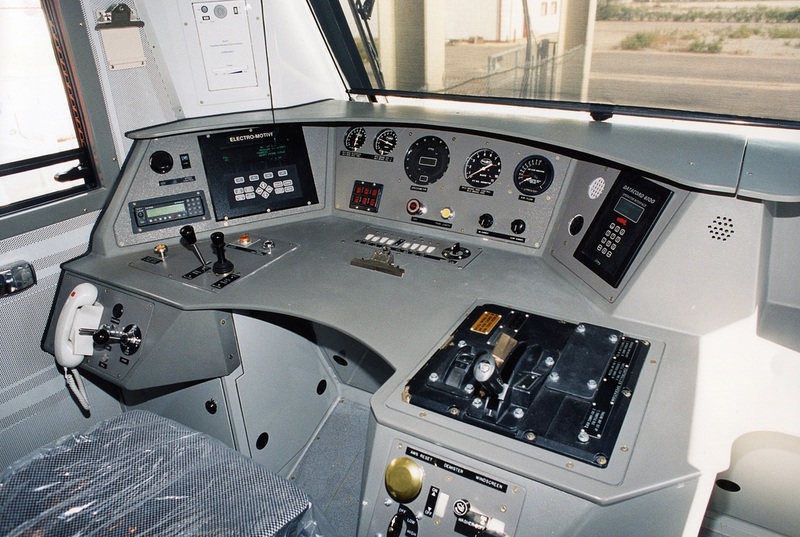 Below: Class 67 fitted with test equipment during pre-delivery trials in Spain. 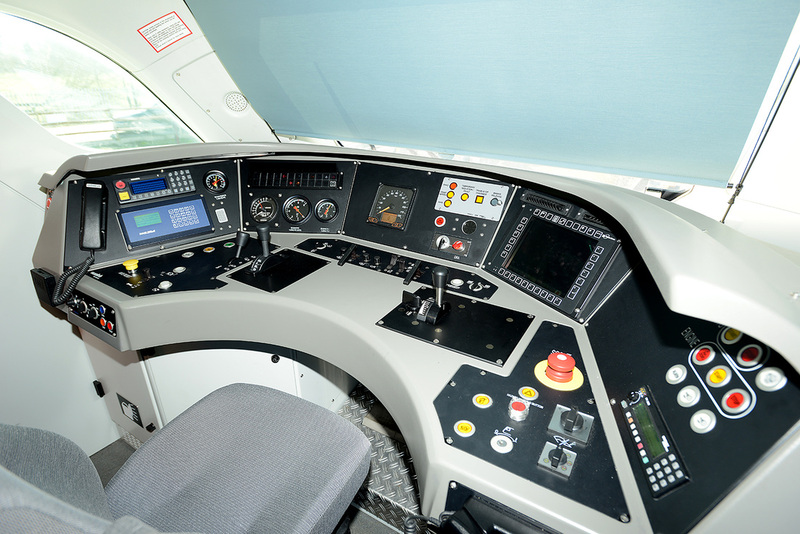 Above: Class 68. No. 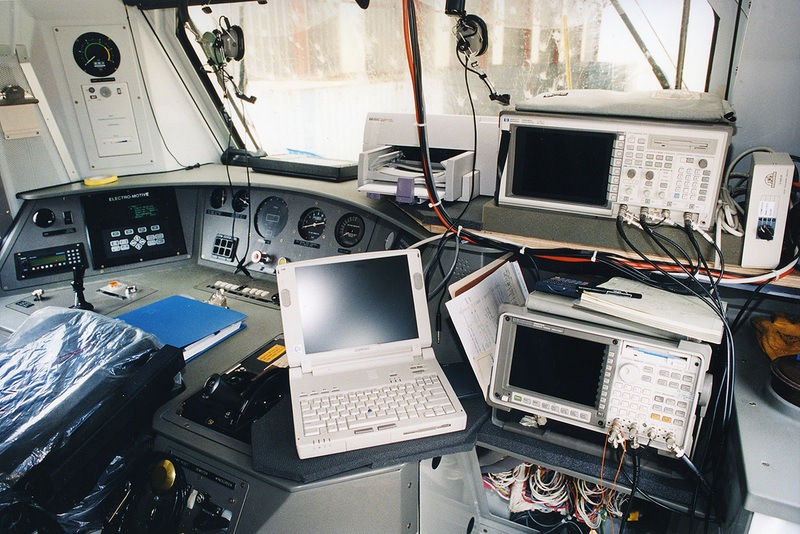 68002. 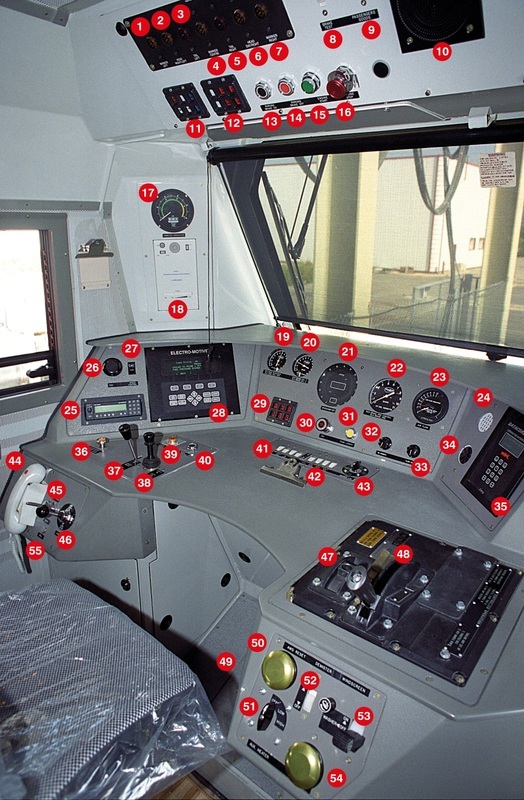 Above: Class 70 (Freightliner) No. 70007.